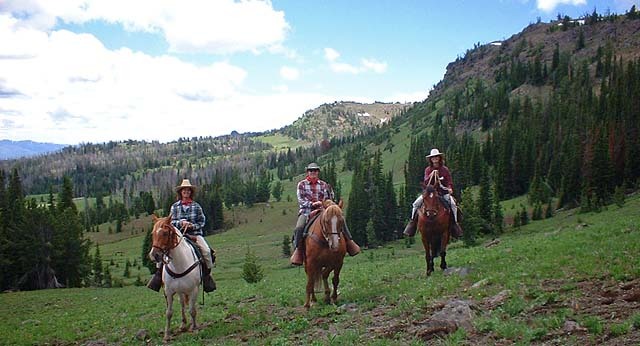 Due to the inherent dangers associated with horseback riding we generally limit the age of our riders to no less than ten years of age on Hourly Trail Rides and twelve years of age on our Mountain Day Rides. All riders must be at least 4′ 6″ tall in order to reach the stirrups on our smallest saddle. As horses are physically limited in how much weight they can safely carry we have a rider weight limit of 240 pounds. For wildfire liability reasons and in consideration of our other guests we are strictly non-smoking on the entire premises. Reservations are required and can be made by telephone or email. We will take calls between 7am and 7pm and we check email regularly. Unscheduled visits are not welcome. At the time of booking we will need a profile on each member of your party which includes age, weight, height and riding experience. This information helps us make decisions on the right horses and saddles to have ready for everybody when you arrive. A deposit of 50% of trip fare per person will reserve any date and time of your choice that has available space. Deposits may be made by Visa, MasterCard or Electronic Check using the Secure Payment Gateway found on the footer at the bottom of this page. There is a small surcharge on credit card transactions. The balance of payment can be made by cash or credit card when you arrive. We do not accept checks. After you have made your reservation we will likely turn away other clients for the same date and time. For this reason the deposit is nonrefundable except in cases where we have to cancel as a result of weather and the ride can’t be rescheduled. Any payments made toward final balance of fare (beyond deposit) will be fully refundable should you be unable to make the ride. No refunds will be given on any ride in progress. Each participant will be required to sign a waiver releasing Medicine Lake Outfitters from all liability. While we consider our operation to be as safe as you will find, there are always inherent risks in riding horses. Riders under the age of 18 will need the signature of a parent or legal guardian. Medicine Lake Outfitters works under the authority of the Department of the Interior National Park Service, Bureau of Land Management, USDA Forest Service Gallatin and Beaverhead-Deer Lodge National Forests, Montana Department of Natural Resources, Montana Board of Outfitters, and Montana Department of Fish, Wildlife and Parks. Contractual and permitted activities take place in Yellowstone National Park, on Bureau of Land Management lands, the Gallatin National Forest, the Beaverhead-Deer Lodge National Forest, Montana Department of Natural Resource School Trust Lands and Montana State Parks.